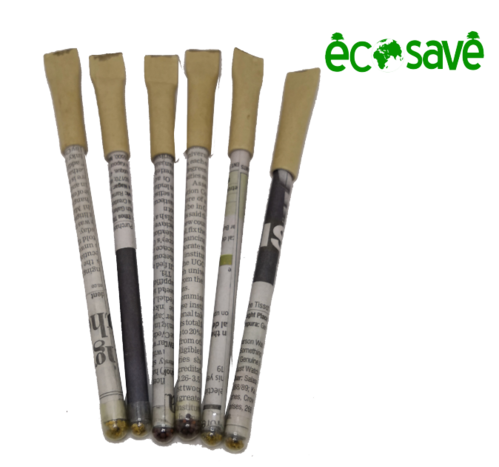 Ecosave Eco-friendly Plantable Seed Pens are made using ecosave's proprietary pen design with 100% lesser plastic!It is made from100% recycled newspaper, and that makes it great as a return gift for your corporate friends and family. These pens containseeds of vegetables, and after it is used, can be buried in your garden pot. Making these seed pens sprout with constant care and watering is a fun activity for kids and adults alike. These seed pens will sprout within 7-10 days and can be used for your home garden or as container garden decor. Save Tree Save Life and Save our Planet . Established in 2002, Vaikuntha Information Technologies is engaged in manufacturing and exporting of Eco Friendly Pen and Eco Friendly Pencil. We export our products to all over the world.